There's a Card for That: Happy Holidays Series | Foxy Winter ft. Lawn Fawn "Into the Woods"
Such a darling design, and I love the embossing, Trina! Your little fox is sweet and can be and beautifully colored! So glad I got to see your critter project showcased at the 2 Crafty Critter Crazies Challenge. Thanks for supporting us, and we hope to see more of your pretty creations in the future. Please check back to see if you are a winner or our next guest designer. Sending you wishes for a wonderful day! Your little foxy is adorable surrounded by all that wonderful snow! I love the shine on the snowflakes and the color your used to make it pop! thank you for sharing this at Merry Monday! What an adorable card to have the cute fox sitting on a log out in the snow. 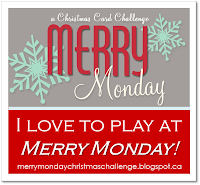 so happy you joined us over at Merry Monday. That is so neat that this is the fox that started it all! Lovely card, wonderful story too!